That is why over the years since this blog took off, I've usually enthusiastically replied "Yes" to media invites for theatrical shows. 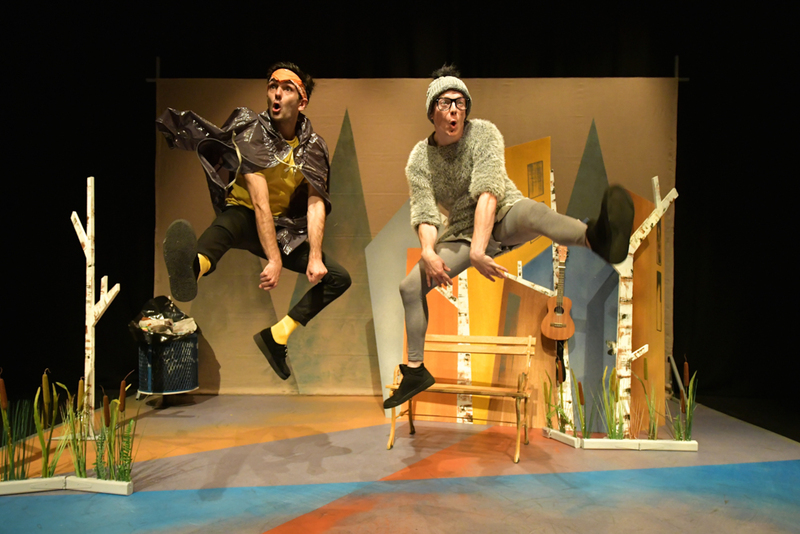 I try my best to do reviews for them in the hope of helping to fuel the growth of children's theatre scene and keep it going vibrant and strong. In case you don't know, these collaborations are not paid so it's always a question of whether you have the passion and love for theatre in the first place. And we do. We really do. 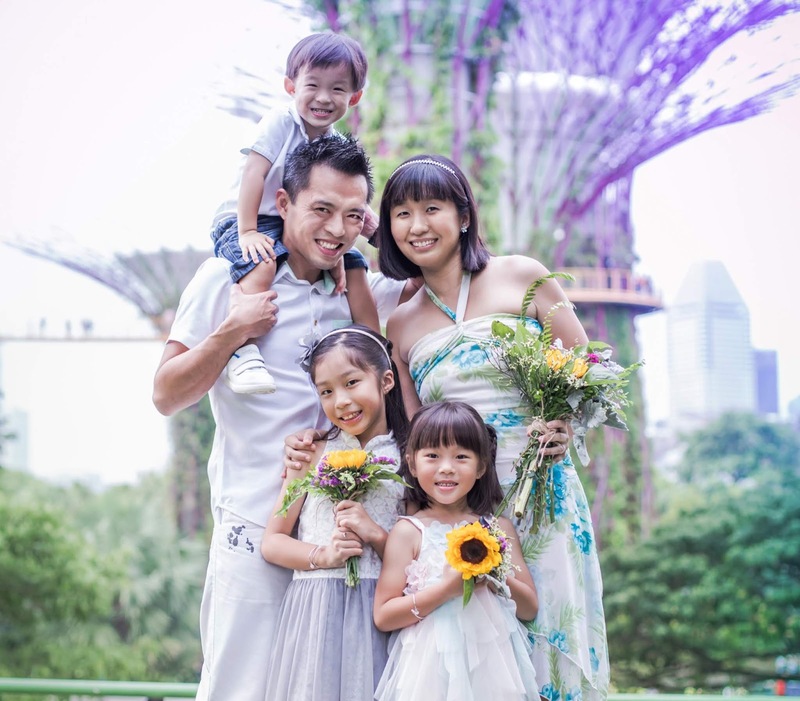 Thanks to KidsFest which was launched by ABA Productions in 2012, we've had the chance to witness world-class theatre which hail from Australia, Britain and United States and more. We see our favourite characters being brought to life, we get to enjoy scenes from our well-loved books on stage, we enjoy quality family bonding when we discuss about the shows, we instill an interest for the arts and culture in the kids, we encourage their creativity and let their imagination flow, we learn important life values which will hopefully stay in their hearts for a long time. 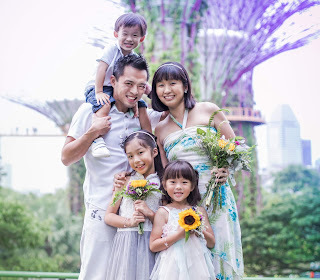 This year, we've had the opportunity to watch two awesome shows at KidsFest 2018 and here's sharing with you all about them. The kids are in love with this well-known tale by Hans Christian Anderson and last year, we bought a book for the little sister so that she could read it during bedtime storytelling. So when I knew that Ugly Duckling was going to make its inaugural appearance at KidsFest this year, you bet we were not going to miss it. Everyone knows the fairy tale story of how the the ugly duckling is teased and laughed at by his siblings, how his mother loves him all the same, how he can't fit in no matter how hard he tries, how he is forced to run away and spends a miserable winter alone, and how he eventually turns into a beautiful swan, spreads his beautiful wings and takes flight with his new family. 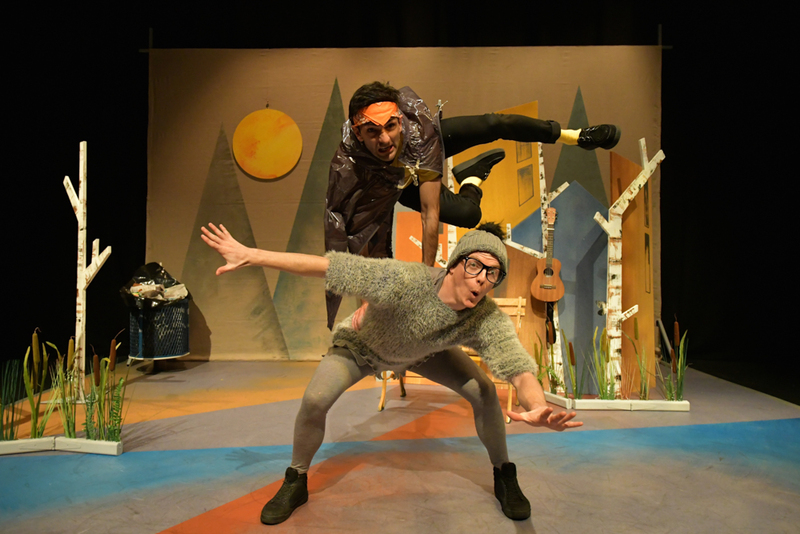 The show, which is brought to life by tutti futti and York Theatre Royal, talks about that and so much more. It is a story about finding self-worth and teaches you to learn to accept yourself; it reminds you of the importance of family and how you should be forgiving; it tells you that beauty comes from within and it's never about what you are born as, but what you do with your life. The three-man cast in this show was terrific and together, they brought to life characters such as the kind Mummy Duck, the bewildered Ugly Duckling, his mean brother Fluffy, and others such as the goose, swan, dog and cat. I'm always so amazed by how they can take on so many roles and yet not get confused about their lines and each character always has a distinct demeanour on stage. 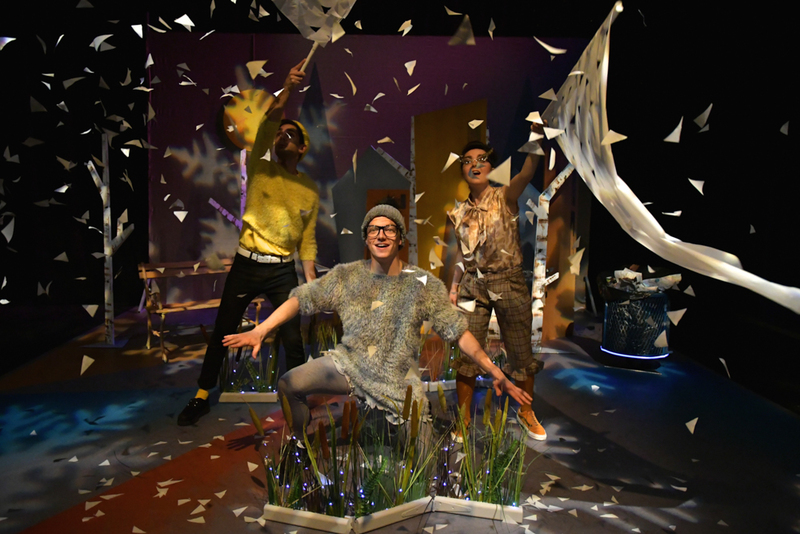 Using creative props, lighting and live music, the story was enacted in a most compelling way and it took us through the four seasons from spring to winter - my favourite was how they used paper scraps for snow and a white cloth for the icy pond. We loved the original songs which were apt and catchy, we were impressed by how Ugly could swim, somersault and dance in the pond, we liked the twist where he showed his filial piety and flew back to look for his mother even when he was a gorgeous swan who had performed for the Queen in Buckingham Palace. 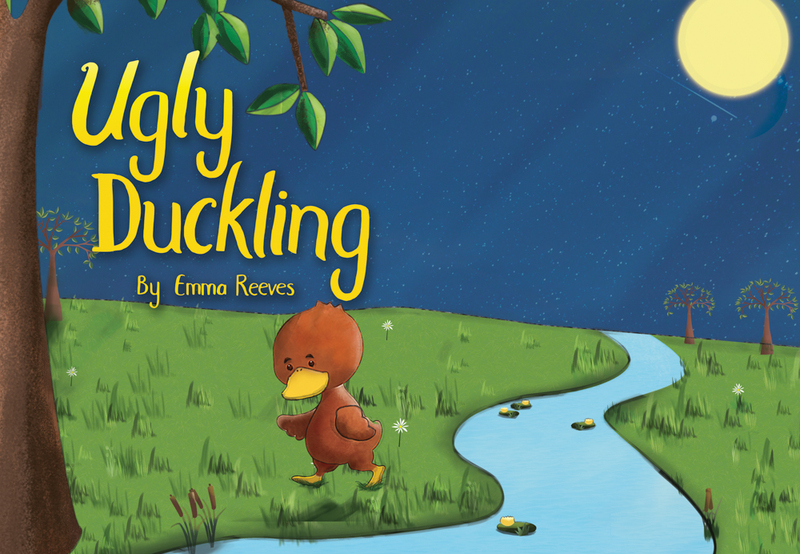 In the final scene, Ugly was with Mother Duck when she had just given birth to a new batch of eggs and among them was a chicken egg which she had picked up from an abandoned nest. Ugly then realised that Mother Duck did the same for him and though she knew he wasn't a duckling from the start, she still loved him as much as she loved her own babies. It was a reminder of humanity, of how we should always reach out a helping hand regardless of our backgrounds, of how our lives are not determined at birth but are as a result of our characters, our beliefs and our doing. To quote what my hubby said, who by the way is someone hard to impress in the theatre, "I thought the cast was awesome! Can sing, can dance, can act, can be funny, can multi-task, can do everything." Well, we can only imagine how much hard work goes behind the scene and are thankful to the crew and cast for putting it together, and that we had a chance to watch this play firsthand. 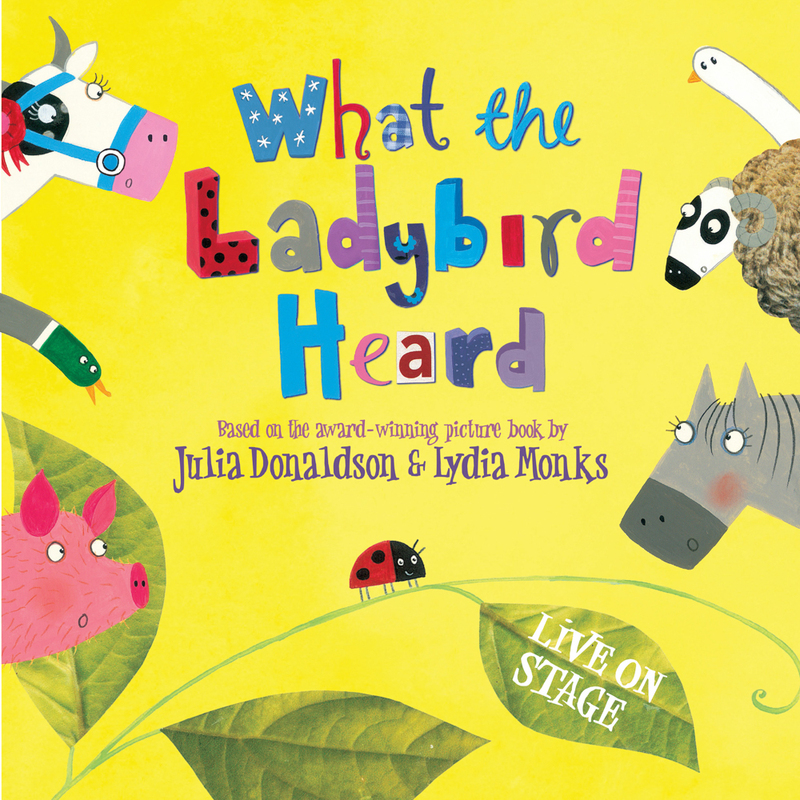 This book by Julia Donaldson has always been one of our favourites - we love that it has so many animals, we love the catchy rhyming words, we love the clever ladybird who never said a word, we even love Hefty Hugh and Lanky Len because these two thieves help to make the story so engaging and hilarious. The first thing that struck my mind before the show began was "How is the cast going to act out so many animals, even if they take on multiple roles? Surely there is over a dozen of them in the book!" That was something I was very much looking forward to discovering. 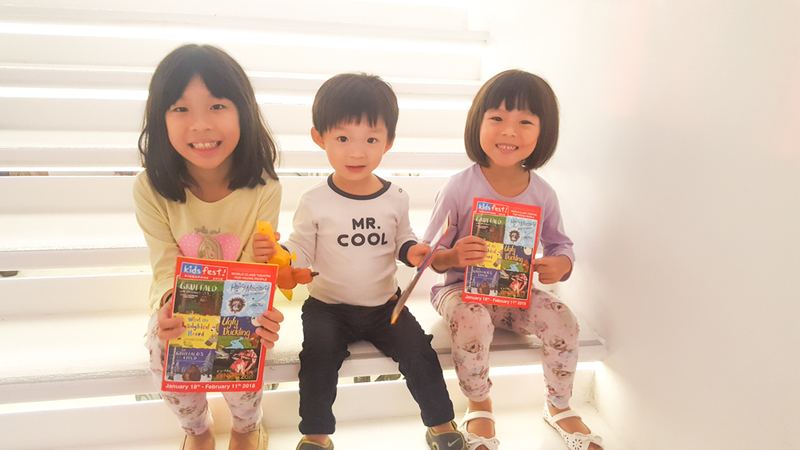 Of course, my kids were also very excited to watch this colourful story being brought to life, so even though they had skipped their afternoon naps as we just explored the crowded streets of Chinatown, we went into the theatre all happy and thrilled about the show. Not long after it began, a surprising moment came when the cast announced that they needed someone to act the role of Lanky Len and started to comb through the audience. Yes, I'm pretty sure that made everyone, especially the adults, sit up and pay attention. It turned out that they picked an usher who was standing at the side and he was totally surprised and goofy when he got up the stage. Angel said to me "Mummy, I know he is part of the cast because he already has a microphone attached to his ear when they called him". Yes my dear, very smart. But still, it was a pretty ingenious move by the cast and it definitely helped to lighten the mood and make things cheery in the theatre. I was impressed by the huge, adorable fine prize cow looking over the fence who always bobbed her head to and fro at the right moments and there were also two cat puppets - one who meowed and one who purred - who sat at the window sill. Wait, so how about the rest of the animals? Well, this was the part that left me awestruck. 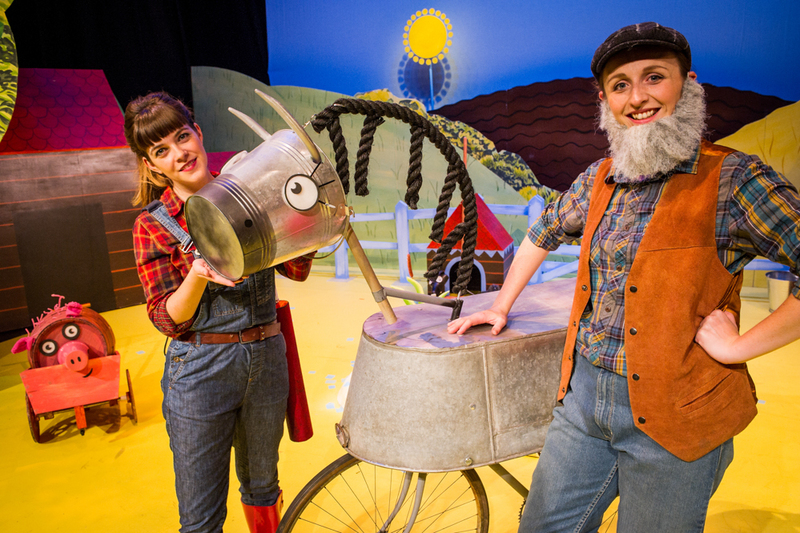 The cast proceeded to make the animal characters out of props found on the farm, for instance a black broom became the dainty dog, a white watering became the goose in the pen, a wheelbarrow and rug became the woolly sheep, a bicycle and a trough became the handsome horse and so on. 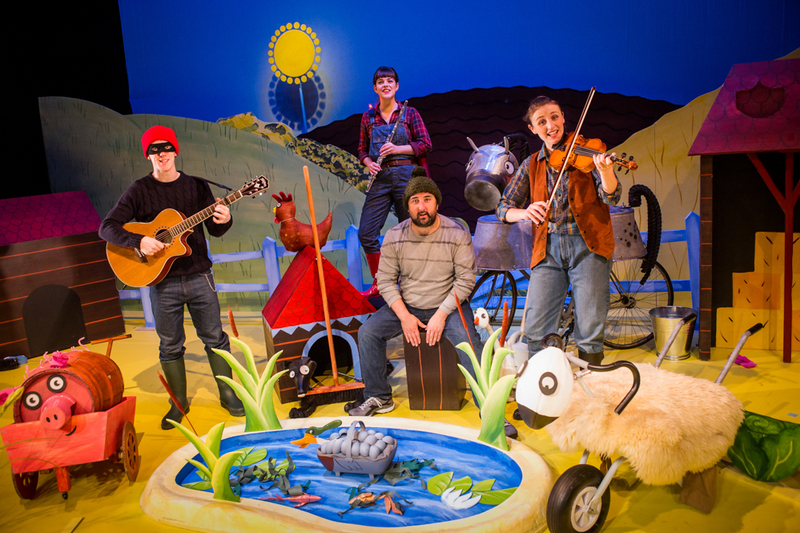 It was really fantastic to see the creativity that went into it and everyone in the audience was blown away every time an animal came to 'life'. As for the ladybird, it would light up at difference places on the stage and the cast would ask the audience to search for it. What a good way to engage the kids, right? There was also a point where the lights suddenly went off and the ladybird became a red speckle of light that danced through the sky. Everything about this show was so engaging that we didn't want to miss any moment of it, not even the toddler who usually gets fidgety and distracted after a while. 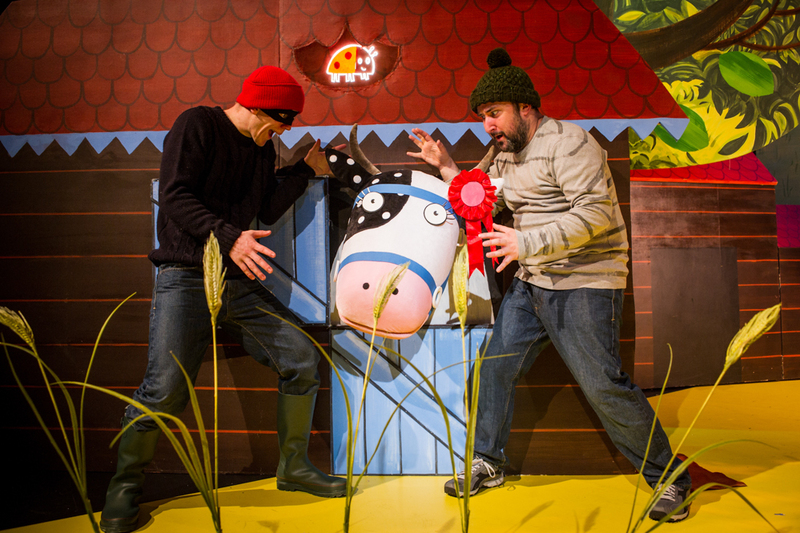 I love the part where Hefty Hugh and Lanky Len drove onto stage in their van, showed off their tools hidden in the back of the van, sang a song and did a dance about them being mean crooks before they started devising a plan to steal the fine prize cow from the farmyard. These two had so much camaraderie that it was fun watching them interact and we were very tickled by their funny jokes and hilarious antics. My kids were also amazed by the use of musical instruments - which was done live on stage right in front of us - that accompanied their every moment when they sneaked into the farm. Everything flowed so seamlessly and we totally enjoyed the awesome acting, the dance choreography, the songs, the puppetry and the use of creative props. Last but not least, there was also a surprise at the finale where the cast asked the audience to stand up and move along to the beat. I remember the hubby and I were saying "How come all of them know how to play musical instruments?" It was all very impressive! One was playing the flute, one was playing the guitar, one the ukulele and one on the cajon. They earned a loud, lasting applause from the audience when the show drew to a close and we totally enjoyed ourselves from start to end too. 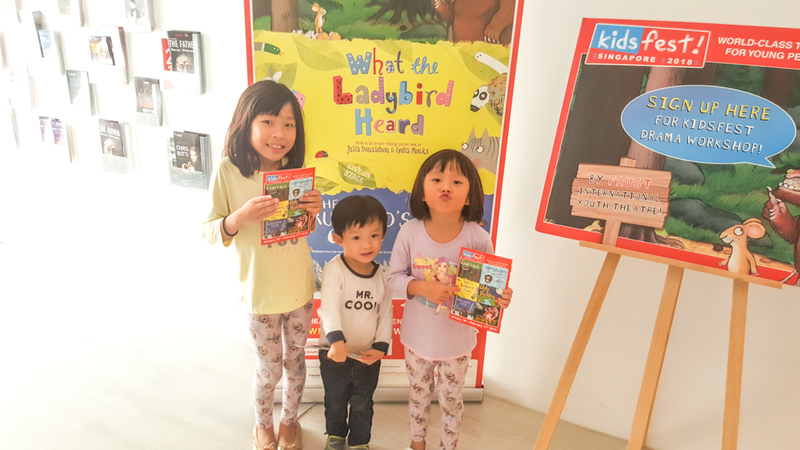 I have no doubt that What The Ladybird Heard will be one of our top favourite shows so far - and we have a pretty long list accumulated over the years. Thanks to KidsFest for bringing to us so many spectacular shows this year! We hope our love for theatre will continue and that we can go on to share more shows with you, our dear readers, in future. Disclosure: We were invited to review the above shows in writing this post. All production images are provided by KidsFest and all opinions are purely our own.